There is a staging process involved in mitigating machine noise. By attacking the noise at the source, you will trigger a more favorable overall value back in terms of decibel level reduction. In Step 1 of our series on industrial noise control, we addressed the idea of building a full or partial enclosure around your noise source. But that is not always so practical, so here in Step #2, we introduce the concept of isolating your noisy work space from the rest of your plant. We are working now to enclose an “area” rather than enclose a “machine” using the same sound barrier blanket system you will see spread throughout our industrial noise control section. Where Step #1 was defined by enclosing your noise source, Step #2 is often times more practical. Here we take the same basic approach, but rather than enclosing the noise source using our sound barrier blankets, instead we use the same blankets to cordon the noise off to a defined space. Instead of building an enclosure around your machine, use the QBS Sound Barrier Blankets as a perimeter sound barrier wall system. Floor mounted, or ceiling suspended, these noise curtain systems can deaden up to 90% of your noise from bleeding to spaces you seek to protect inside your plant. In either case, Steps 1 and 2 are all about using sound “barrier” treatments to attack and block the source of our noise. 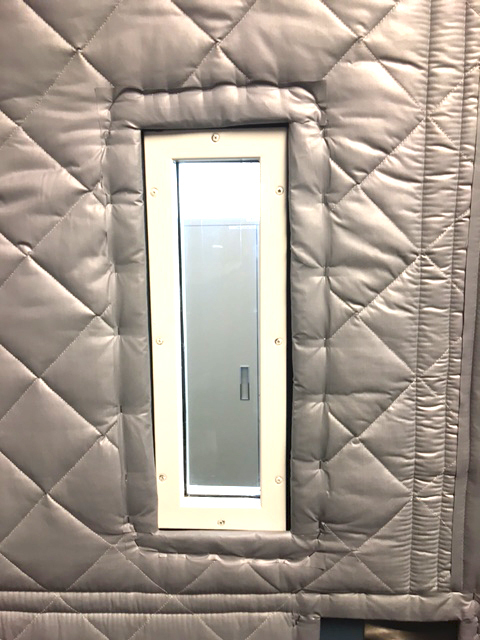 Whether you are enclosing your machine, or your targeted work space, sound barrier treatments will out perform Step #3 in your project, which will be to further reduce your noise exposure levels by absorbing ambient echo. Isolating your noise infested work space from the rest of your plant allows you to step back from the source of the noise and let it perform its process. 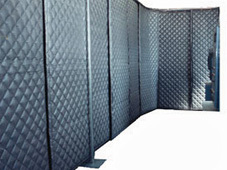 We use the same QBS Sound Barrier Blankets and build full or partial walls designed to block directional noise to an adjoining space. The blankets are used to define the noise infested work space, and house the noise inside the contained area. Blankets can be cut up to 25’ tall to suspend from your ceiling, and be used to divide your work space, protecting the people working in other areas of your plant. 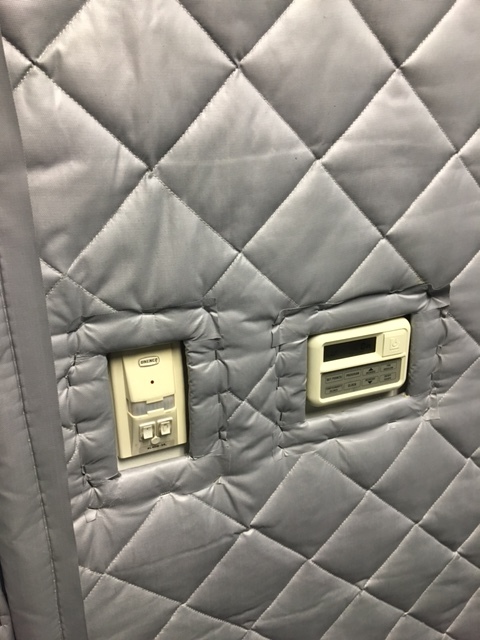 The same blankets can be used to affix to the outside of in-plant office walls and protect office staff working inside loud infested factories. Noise barrier curtain systems can also be built using sound blankets that suspend from floor mounted frames on caster wheels. There are a variety of sound isolation solutions for introducing QBS Sound Barrier Blankets. The more creative you get with introducing them into your equation, the better your overall values back will be. The taller you go with your noise control curtains to section off a noise infested working area of your plant, the better your overall values back will be. We cut the QBS Blankets up to 25′ tall to drape down from your ceiling, or from a wrought iron bar that you suspend down like a shower curtain rod, and then hang the QBS Blankets from the rod. There are times, however, when using the ceiling is impractical for suspending your noise curtain system. Instead, clients often opt for our SoundScreens. Here we supply an 8′ tall tubular framing system with adjoining blanket that lets you free stand your curtain system out in front of your noise source. The framing is included with your order, and can include either a T-stand for your floor mount, or caster wheels for portability. 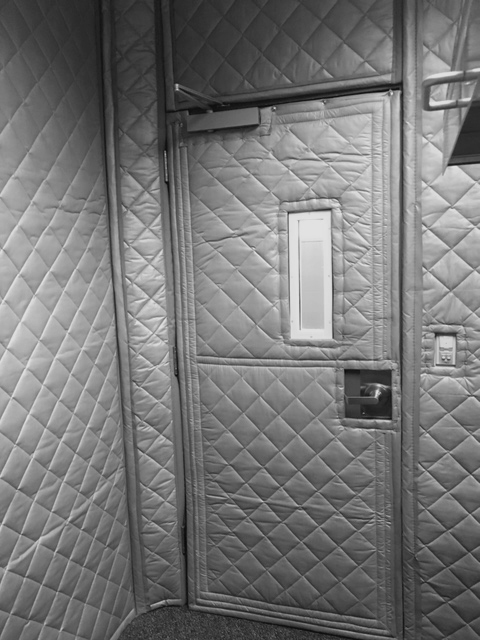 Intel had a series of loud machines housed inside its own mechanical room. Rather than building noise control enclosures around the machines, they chose instead to back away from the units so they could perform their process, and instead, anchor the same QBS blankets to their perimeter walls and prevent the noise from leaking out to adjoining rooms. They were using the walls of this room as the structure to mount the blankets from. QBS Blankets are class A fire rated. They are easy to hang, they are portable, detachable, easy to keep clean, and combat up to 80% of directional noise. We grommet across the top for ease in self installation, and Velcro down the edges for interconnecting the sections to minimize your leakage points. 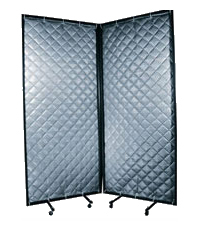 The blankets can have windows, patches, openings, slits, strip curtains, and more cut into them to make the user friendly for your treatment. We will CAD draw the blankets for your approval on dimensions prior to production. These blankets are the perfect treatment option for most industrial noise control projects. Use this form to help get us started working together on your upcoming noise isolation project. We look forward to resolving your noise issues, as we have done now for more than a quarter century. Once we receive the information you submit here, your project will be handed to one of our sound consultants who will be back in touch with you shortly.